Freedom looks to Dan for their training session. We’d like to share another step in Freedom’s training with a journal entry from Dan Hnilicka, Freedom's principal trainer. 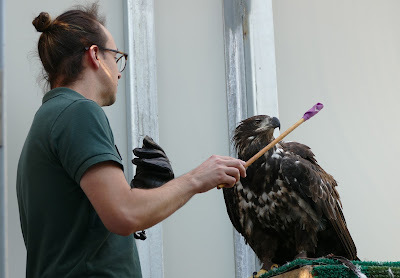 We often get comments from the public about how comfortable on the glove the birds appear during programs. While it is a reflection of their trust in their handlers, it is also a result of many hours of training. One behavior that Freedom is currently learning that will be transferred to when he is on the glove in programs is “targeting.” Targeting is a behavior in which an animal touches or orients a part of its body to a specific target. The target could be anything from the end of a stick, a glove, a buoy, or even just a specific perch. Currently, Freedom is learning to target his face towards the colored end of a stick (you can see this in the second photo). Essentially, if Freedom looks towards the end of this stick, he receives a treat. Learning this simple behavior is beneficial for Freedom’s future husbandry and management, but also his future behavior on the glove. Also, this kind of training encourages the bird to be more confident. Moving and interacting with the target allows Freedom to make choices to earn reinforcers. Freedom and Dan working on target training. Freedom takes a bite of food from Dan. 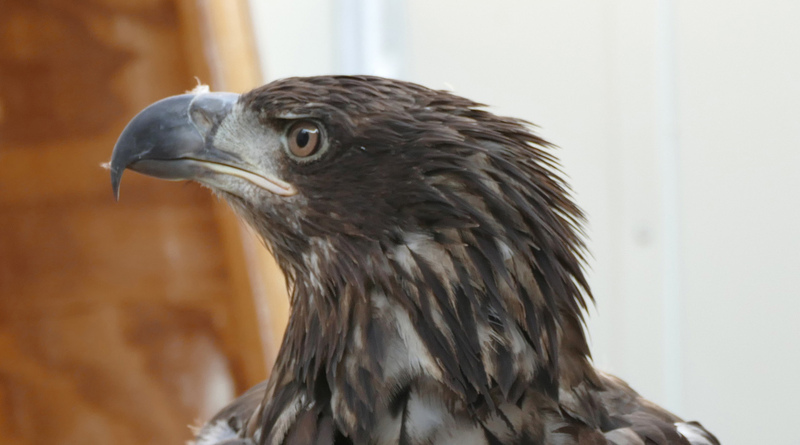 If Freedom knows to voluntarily move his face towards a target stick, we can easily ask him to move from perch to perch to see various parts of his body up close and moving for a visual exam. Also, when on the glove for a program, we can ask Freedom to move his head upright, which is a behavior visitors often view as “comfortable.” What they don’t realize is that our birds are specifically reinforced when they exhibit behaviors that can be labeled as “calm.” We want our education birds to best reflect how their counterparts in the wild would be behaving and training such as target training helps us to do that. Thanks for the post. Seems as if Freedom is coming along just fine. Certainly appreciate the updates. Thanks Dan for all of your work with Freedom.